Elegant, high quality with attention to detail, the ANSI approved LWS-M insulated attic ladder is made from quality pinewood that can be assembled in three sections. This is a DIY ladder that requires assembly. LWS-M is equipped with a locking mechanism that is installed inside door panel. Length of ladder may be adjusted within 1 inch after cutting the side rails to set ladder evenly on floor. Construction of the LWS-M attic ladder provides more steps (tread rise about 10 inches). Red, metal handrail may be purchased separately and installed on either or both sides of the ladder to increase safety and comfort. Springs are located on door surface to make entry to attic wider and more comfortable (the widest entrance on market - compare to other products). Door is well balanced - it opens and closes easily (NO sudden movements). Fit rough opening 27 1/2 in. x 47 in. and ceiling heights 7 ft. 2 in. to 8 ft. 11 in. 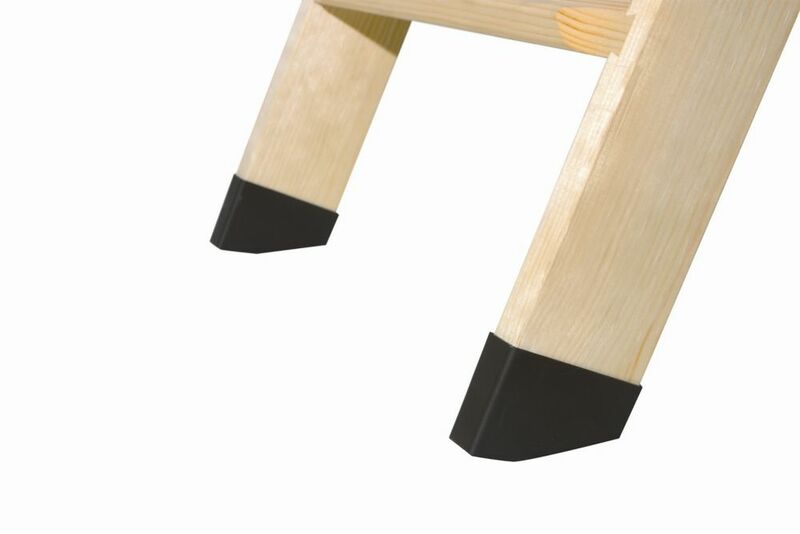 The ANSI approved LWN attic ladder is made from quality pinewood assembled in three sections. The LWN is equipped with a string to pull down the ladder. Length of ladder may be adjusted within 1 inch after cutting the side rails to set ladder evenly on floor. Construction of ladder provides more steps (tread rise about 10 inches) to improve safety and comfort. A red, metal handrail is available for purchase and may be added on either or both sides of the ladder to increase safety and comfort. Ample space between ladder and attic door for comfort and safety. Springs are located parallel to the door making entry to attic wider and more comfortable (the widest entrance on market - compare to other products). Door is well balanced - it opens and closes easily (NO sudden movements). Fits in rough opening 25 in. x 47 in. and ceiling heights 7 ft. 11 in. to 10 ft. 1 in. LXS Plastic Ladder Ends is rated 2.5 out of 5 by 17. Rated 1 out of 5 by MEJ from Cheap, thin plastic that provided no value. Cheap, thin plastic that provided no value. Rated 3 out of 5 by Musicman from They did not fit exactly to my steps. But I maid them work. They did not fit exactly to my steps. But I maid them work. Rated 5 out of 5 by JMC from Th plastic end caps fit perfectly. I don’t know why... Th plastic end caps fit perfectly. I don’t know why they aren’t included with the ladder, they should be! But I’m satisfied.